Crash deaths increased 6 percent in the U.S. last year, as people choose not to drive safely, new data say. Washington state’s rate improved somewhat as lawmakers propose stricter bans on driving while using a cellphone. Motor-vehicle deaths increased 6 percent nationwide last year, a disturbing trend that halted decades of progress, according to preliminary National Safety Council figures released Wednesday. 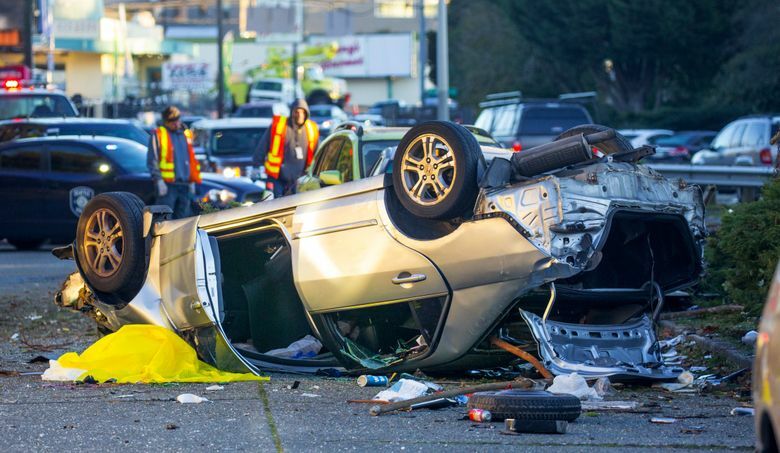 Of the 40,200 U.S. fatalities, 536 happened in Washington state — an improvement from the 567 a year earlier but more than the 467 lives lost in 2014. “Forty thousand people would fill the Titanic 10 times, two Empire State buildings, or Wrigley Field where the Cubs last year competed for their World Series title,” said Deborah Hersman, CEO of the Illinois-based safety council. That’s a rate of more than 100 fatalities a day, she said. “Where is the outrage?” she said. National death rates were 14 percent above 2014 levels. An estimated 4.6 million Americans were injured in crashes last year. Driving miles increased 3 percent last year, in the post-recession boom, but that doesn’t explain the entire spike in fatalities. It happened despite long-term improvements in seat belts, air bags, safety-warning systems and other technologies, Hersman noted. “What has not changed is our human fallibility,” she said. Washington state lawmakers are currently considering the Driving Under the Influence of Electronics Act, introduced by Rep. Jessyn Farrell, D-Seattle, and Sen. Ann Rivers, R-La Center. It would ban all use of handheld devices by drivers, increase the $136 standard fine to $235 on the second citation and forbid watching video. The bill’s sponsors are in talks with skeptics who object to targeting a technology rather than erratic driving. Rep. Dave Hayes, R-Camano Island, filed a competing bill to encompass more kinds of distraction, such as eating or grooming, but as a secondary offense, to increase the fines after police stop someone for other violations. Hersman called for bans on drivers’ cellphone use — including hands-free devices — in all 50 states. Illinois bans handheld use but not hands-free, she noted. The National Safety Council also recommends pervasive use of red-light and speed-enforcement cameras, and for safety features such as blind-spot warnings and rear cameras to be standard vehicle equipment. Polling found that 83 percent of respondents correctly put road hazards atop the list of common safety risks, Hersman said. But one-fourth said they speed in residential neighborhoods, nearly half said they consider it safe to text while driving, and at least one-tenth admitted driving after using alcohol or marijuana in the past month, she said.